Description: At the edge of a grand estate, near a crumbling old mansion lies a strange stone building with just a single room. In the room there lies a bed. Born of demonic power, the bed seeks the flesh, blood and life essence of unwary travellers… Three pretty girls arrive on vacation, searching for a place to spend the night. Instead, they tumble into nightmares – and the cruel, insatiable hunger of the Bed! 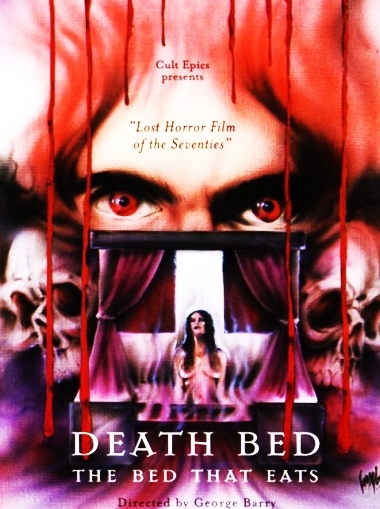 DEATH BED is a one-of-a kind experience: comic, horrific and dreamlike, that truly has to be seen to be believed. Discover this neglected marvel of American horror for yourself! Great surreal horror. By chance do you have the similar “Beyond Dream’s Door?” This is a monumental cult film, and the dvd costs freaking 80 bucks! A while back I requested and you shared “Butcher, Baker, Nightmare Maker,” another fantastic title that is available on disc, but at an insane price. I don’t know how, but you guys have access to so many rare movies. It’s astounding. Anyway if you do have access to “Beyond Dreram’s Door” I’m not the only one who would be thrilled beyond words! Commentary is with director George Barry.